I can honestly say I don’t think I’ve ever been excited about a refrigerator before. The one I have at home is nice, I guess? It’s got an ice maker and keeps my food cold...that’s pretty much all I assumed I needed in one. I rarely dove into the kitchen world and all their various (and sharp) tools or appliances and preferred to just eat the food, than be concerned about what held them. I couldn’t figure out exactly why at first, because I definitely had an appreciation and admiration for nice kitchens whenever I’d see them in commercials or in backdrops of beautiful homes on Instagram. No experience of my own that I could really attest to, just ads. So when I attended the JennAir event, I wasn’t sure what to expect. I knew JennAir was under the umbrella of Whirlpool and Maytag; so the only expectation I could be sure of was quality. Other than that, this was all going to be new. As soon as I entered the event hall, JennAir definitely made their presences known. Stylized lighting hanging from the sealing, gigantic projection screens behind the DJ, and some of the most unique food I’ve tasted in quite some time. JennAir wasn’t just out to be any appliance brand, but one that reflected the uniqueness and lifestyle of creatives, innovators or anyone else who just happens to be a little more bold. Along with that came some well received highlights such as the mini tequila and mezcal tasting which I’m now thinking needs to be a common occurrence in my life. I am definitely sleeping on mezcal and that’s changing as of this post. The food served some of the most delicious and interesting I’ve had in recent memory. One item in particular really stood out, which was hard to do amongst a list that included mini meals made of caramelized milk bread, fermented garlic leather, and trumpet mushroom or wild trout roe, brown butter, chicken skin, and endive. The stand out recipe was the Pacific Amberjack, smoked bone marrow and salted plum. Couldn’t wait until these delicious morsels came back to me again. They were so addicting and unique that those almost stole the show for me alone. Much love to the chef Jordan Kahn for blowing minds with ease. When I finally got around to checking out my first appliance. I really got it. I couldn’t believe I was thrilled to have my hands on a stove, but I couldn’t help it. I was REALLY impressed by the Smoke & Brass model. This thing was a beast! JennAir breaking the typical “one size fits all” notion of luxury is really sticking true to their “Bound By Nothing” image. I saw some images online and got an idea of what they wanted. Seeing it in person, is a completely different experience and the only way to fully understand what’s being accomplished here. I wanted this stove, immediately. I hadn’t realized how similar all appliances I had “liked” were and this was just a punch in the gut to them and me. Actually, it punched me in the gut a few times, I was so oblivious. It encouraged me to cook on the spot. I wanted to use it and turn it on and see any special knobs and doo-dads it could’ve had. It was on the event floor, so it wasn’t active ( I had enjoyed that tequila tasting remember, so wise choice by JennAir). That burst of energy was unexpected and only exemplified once I saw their line of fridges. If there’s anything JennAir can guarantee is that you’ll have a bit more disdain for your own kitchen after spending some time with these. 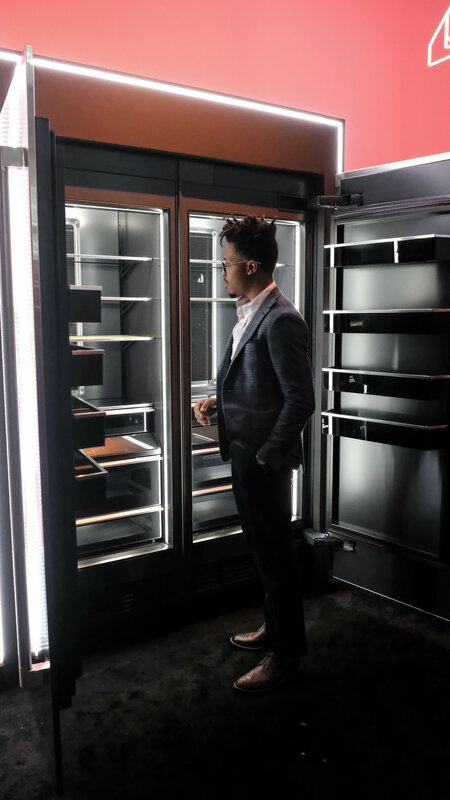 This Fridge in particular, from The RISE™ design expression, was a 30 inch column fridge that had the most beautiful interior lighting that aided in this holy grail moment every time it was opened. It was sleek and modern, with a sturdiness that kept it from looking like flimsy tech and more like a swiftly crafted machine that you want to show off to all your friends and the random people who walk by on the street. If this was in your kitchen, it’d probably be the prettiest thing in that kitchen if not the whole house. The handles on the outside were strong and had a weight to them that reinforced the quality of the product I was holding. I left that night really looking at Kitchenware a bit differently; both with eagerness and a bit of boredom due to the similarities in the other that regularly populated my life. Discovering something new to look forward to is never a bad thing and much to my surprise; my recent discovery came in the form of a stove and fridge.